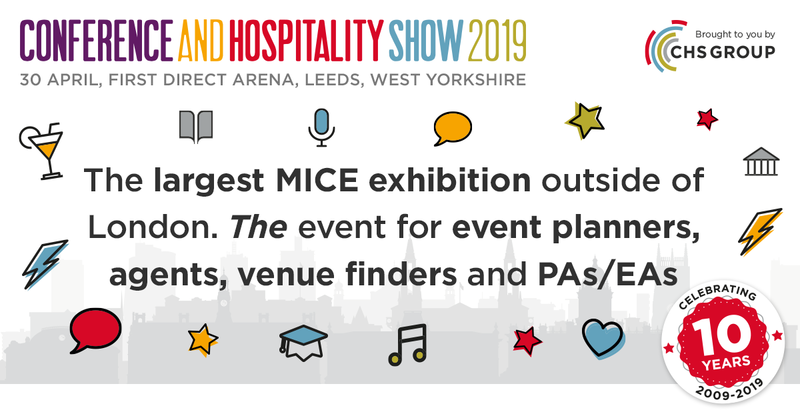 The largest UK MICE exhibition outside of London, The Conference & Hospitality Show (CHS19), is set to celebrate its 10th anniversary this April! Taking place on Tuesday 30th April at the First Direct Arena in Leeds…great city centre location! Having developed a reputation as THE event for event planners, agents, venue finders and EAs/PAs, if you are responsible for organising exhibitions, conferences, meetings large or small, or anything in between, CHS19 is for you. It’s a packed schedule with plenty to see and do, here’s our list of some of the highlights so that you can plan to get the very best from your day. There’s a big focus on education with seven sessions running throughout the day tailored towards event professionals, PA’s and EA’s. Founder of Practically Perfect PA, Nicky Christmas, will head-up panel discussion - how to create an amazing partnership with your boss – together with Beth Arzy, Executive Assistant for two Department Heads in the Consumer & Strategy Department at Channel 4. Chair of the Association of Professional Administrators in Ireland (the APAI), Natalie Egan, and Abigail Jones, winner of PA of the Year 2018 and currently EA to the CEO of ghd. The panel with share their insights to equip delegates with the skills required to position themselves as a key part of their organisation. As part of the ‘Future of Events’ series, digital marketing specialist and social media special, Jonny Ross, of Fleek Marketing will discuss the role of social media and digital in events, Liz Taylor, founder and managing direct of Taylor Lynn Corporate will look at the future of event design and Nick Tinker, regional business development manager of CrowdCompass by CVENT, will take delegates through the future of event technology. Fitting for a tenth anniversary, TED talker, coach and motivational speaker, Gavin Ingham will deliver his aptly named I am 10 presentation, a strategy to help delegates, be more, do more and have more in business and in life. CHS are pleased to announce popular television chef, Simon Rimmer, as their Keynote speaker. Simon who will be ‘in conversation’, with Samme Allen, chair of the CHS Awards, who will lead a Q & A session taking questions from the floor, where delegates will get the chance to meet him and ask about his career as a talented chef and owner of fourteen restaurants in the Northwest and Dubai. Simon admits his passion for food began as a restaurateur and continues to cook in the restaurants every week, which he enjoys immensely as it also keeps him in touch with changing culinary trends. The Conference & Hospitality Show regularly welcomes plenty of return exhibitors to the show. The tenth anniversary event has also attracted 30% of new exhibitors including Emmerdale Studio Experience, Chelsea AFC, Everyman Media Group PLC, and The Crystal Maze LIVE Experience. The landmark anniversary has provided a perfect platform for these new exhibitors to promote their offer to a perfect audience of event professionals and buyers, PA’s, and EA’s. To mark a special tenth birthday, VIPs will also get the opportunity to take part in an exclusive prize draw, Shangri La Hotels and Resorts, named a Tale of Two Cities, which features a one night stay at Shangri- La, The Shard, London, before the lucky winner will be whisked off by private transfer to catch the Eurostar for an unforgettable two night stay at Shangri-La Hotel, Paris, offers unmatched views on the Eiffel Tower and breakfast for two. The team at CHS is very excited about the tenth anniversary show and would love to see you there!